ETF - What Does It Mean? What is an ETF? What is the definition of an ETF? 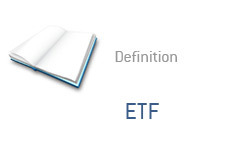 First off, ETF stands for Exchange-Traded Fund. The simplest way to describe an ETF is to say that it is like a mutual fund that trades on a stock exchange. An ETF is similar to a traditional mutual fund in that money is pooled together from investors and invested in any number of different assets. The assets that the ETF invests in can vary widely. For instance, SPY, or "Spiders" as they are often called, look to track the S&P 500. QQQQ tracks the Nasdaq 100, while DIA tracks the Dow Jones Industrial Average. There are all sorts of different types of ETFs - bond ETFs, currency ETFs, commodity ETFs, leveraged ETFs, etc. In total, there are more than 1,500 ETFs currently trading today. ETFs have become so popular due to the fact that they can be traded like stocks.